Naples on Mulberry Street, 1964. Dye transfer print, 20" x 16". Courtesy Peter Blum, New York. Hofer's images seem soaked into the paper, as indeed the making of photographic prints requires, and even more elaborately the making of layered dye-transfer color prints. Saturating the flat rectangle within which they appear, the images represent, of course, the world that is already saturated beyond measure, even beyond the dimensions we nominally discern. In reducing three dimensions to two, a falsification occurs in the presumed elimination of one dimension. But which dimension? Normally one would say depth, but in fact, height and width are no less falsified, not only in relationship to size (photo to reality) but also to the extent that depth changes the other dimensions. In any picture, all three occupy the thickness of the paper. But in Hofer's work, more than in the work of any other photographer, density contains immanence and becomes the site of its own reality. Even in photographs that depict deep and broad spaces, such as the cityscapes in her 1964 book with V.S. Pritchett, New York Proclaimed, Hofer seems to emphasize the foreground plane, so that people, objects, and buildings demand our immediate attention and obstruct any view into a further distance. There is always something directly in front of us. The photos exhibited here are all still lifes in which there are only shallow foreground planes. It's not as though nothing else exists, but that these things exist intensely. Naples on Mulberry Street of 1964 is a wonderfully playful set of variations on spatial illusions and perceptions, shallow space, picture plane, and some of the common tropes of art history, in a very mundane and familiar place. 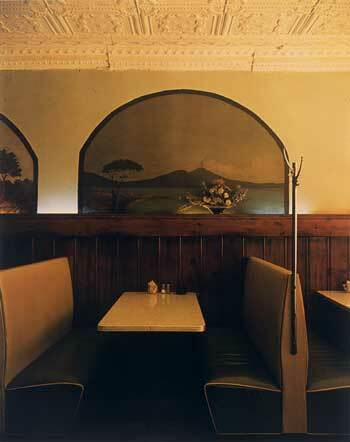 The incipient one-point perspective of the booth and its benches (reinforced by the diagonals of the tin ceiling) end abruptly in the vertical and horizontal wooden wainscoting of the wall. Nonetheless, we are invited to continue on to Mt. Vesuvius through the Bay of Naples, but of course it is only a landscape painting, and anyway it is partially blocked by a flower still life that might itself be a subject for the picture. Another still life--a very meager grouping of the usual sugar, salt, pepper, and ashtray--is in the path of the perspective, and is perhaps its focus. A cat on a bar in Dublin, two chairs in London, her hotel telephone in Kyoto are equally mundane, saturated, and eccentric, but then there are other special objects in compressed spaces that are reminders, like Veronica's veil or Van Gogh's boots, of people--Alexander Calder, Bill Brandt, Diego Rivera, Marianne Moore--and lives that she is, and perhaps we are, aware of. 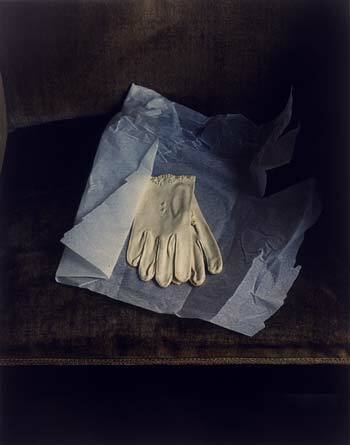 Marianne Moore's Gloves is the most ephemeral, and at the same time the most certain of these pictures--white gloves on light blue paper placed on a dark brown wooden table--white, blue, and brown; cloth, paper, and wood--curiously combined, essential triads, all organic, moving from soft to less soft, animated to rigid. Whatever the blandishments and conceits of engaging the viewer, these objects are concealed in their own space--the table tipping upward, the thickness of the paper--to be seen and acknowledged by us from the outside, for we are not there but in our own spaces. It is, in a way, a sacred space, and this is made almost explicit in the later still lifes of 1996-97, which pay homage to the Spanish still-life painters of the 17th century, Zurbarán in particular. Fruits of various kinds--among them oranges, grapes, pears, cherries, and lemons--fill baskets and pewter plates and bowls placed along a dark brown wooden table, perhaps the same one that appears in the Marianne Moore photo. In the fullness of life, almost every shape is spherical and compressed into the shallow space of the table by the black background. There are only these things to contemplate--fullness, darkness, and light. Rearranging an observation begun in the time of Apelles, the 4th-century B.C. Greek painter, it is hard to believe that these photographs are not paintings. 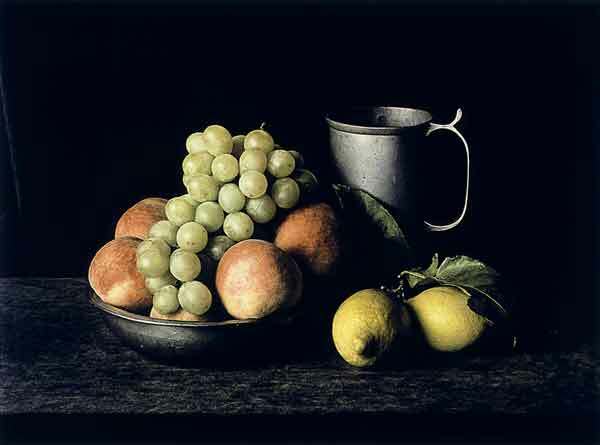 Pewter Pitcher with Grapes (Still Life #7), 1997. Dye transfer print, 20" x 24".